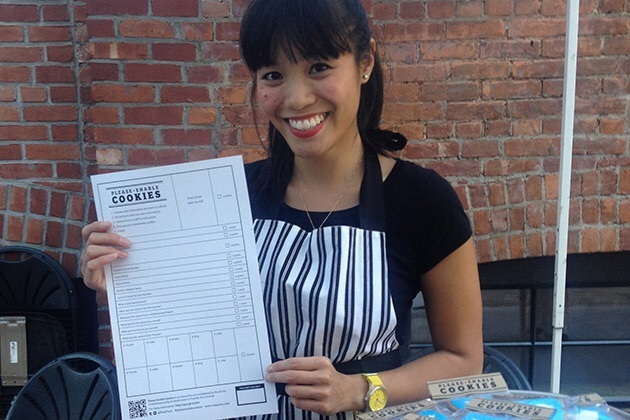 In a highly unscientific but delicious experiment last weekend, 380 New Yorkers gave up sensitive personal information — from fingerprints to partial Social Security numbers — for a cookie. Puno said some participants did not even eat their cookies — they just wanted to take pictures of them. Cookies decorated with the Instagram logo were so popular among photographers that Puno required "purchasers" to give their fingerprints, the last four digits of their Social Security numbers and their driver's license information. Many still agreed. "They wanted to hold it against the sky with the bridge in the background," she said. While she's happy with the response to her project, the 33-year-old artist was shocked that people seemed very comfortable giving away the kind of data that's often used in security questions: pet's name, mother's maiden name, place of birth, the name of your first teacher. People called those questions "easy points," she said. "They didn't recognize them as security questions, or they didn't care, but that's how people 'hack' into celebrity iClouds, by guessing their security questions." She was also surprised to find that people would give her more data than they actually needed to earn a given cookie. "That to me was baffling," she said. "If I were thinking about giving away my information, I wasn't giving away more than I had to." Puno still won't say what she's going to do with the data. She says she's considered destroying it. On the other hand, she said, the disclosure forms are also "precious artifacts of what people are willing to do. I kind of want to hold onto them forever."